Mr. Ezhilan said that it was the LTTE leader, Mr. V. Pirapaharan, who conceived the idea to honor the parents of the martyrs as well during the Great Heroes’ week celebrations. S.Ezhilan, Vavuniya district political leader of the LTTE addressing the parents of martyrs at Sasthrikoolankulam in Vavuniya. Ms.Thamilini (Extreme left) Political wing leader of the women section of the LTTE and Miss. Alai, Vavuniya district leader of the women section are also in the picture. Ms. Alai, the head of the LTTE’s women’s political wing in Vavuniya, presided over the event. Ms. Thamilini, the head of the LTTE’s women wing, and Mr. K.A. Senthilnathan, the Vavuniya district head of the All Ceylon Tamil Congress (ACTC) also participated and lit flames in honor of the martyrs. Continued Mr. Ezhilan: “Our food, our clothes are all possible because of your help. In addition to the fighters you provided, every cent you provide also strengthens the struggle. We are operating in the belief that our struggle will bring about the needed change for the people. “It is no small matter to honor the parents of our martyrs in a Sri Lanka Army-controlled area like Vavuniya. This is the first time such an event is being held in Vavuniya. In addition this is the first event of this nature in SLA-controlled areas of the North East. 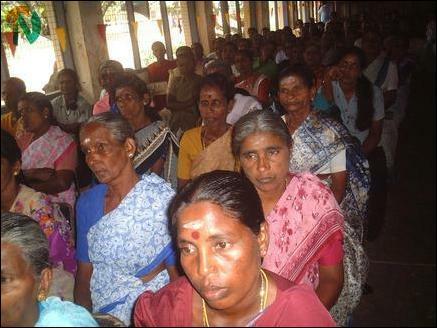 A section of the martyrs' parents who gathered at the Sasthrikoolankulam function. 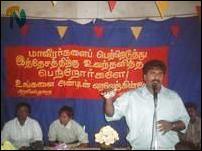 Ms. Thamilini and Mr. Srinath of the LTTE’s political division in Vavuniya also spoke. In the Vavuniya district, functions to honor the parents of martyrs have already taken place at Chettikulam and Muruganoor. Another such function will be held at the Muthiah Hall in Vavuniya town on November 26, sources said. There have been 17,652 martyrs so far. A football competition in honor of the martyrs is being held in Vavuniya, and the finals will be held at the Urban Council grounds Monday, sources said.